Many people who think they have acne actually have ingrown hairs. It's easy to mistake ingrown hairs for pimples because they look so similar. But their causes and their treatments are different, so it's important to accurately identify them so you can treat them correctly. Do you have acne pimples or ingrown hairs? Here are the differences. A pimple forms when a plug of oil and dead skin cells blocks the opening of the hair follicle or pore. When the pore becomes engorged with enough oil and acne-causing bacteria, the pressure can rupture the follicle wall. All that material spills into the surrounding skin causing irritation, redness, and swelling. In short, you have a pimple. Ingrown hairs develop in hair follicle as well, but they aren't formed by a pore blockage. Instead, it's the hair itself that goes awry. Normally, hairs grow straight up and out of the pore. In the case of an ingrown hair, the hair grows sideways back into the skin through the follicle wall. The skin now sees this hair as a foreign invader. This causes redness, swelling, and sometimes pus. The resulting bump can look remarkably like an acne pimple. Got pimple-like bumps mainly in areas where you shave? They're probably ingrown hairs. If you shave, wax, or tweeze, your chances of developing ingrown hairs in that area also go up. When the hair grows back, the sharp edge makes it easier to pierce the skin and grow into it. Ingrown hairs are more common in those with curly hair. As the hair curls, it can easily get redirected and start growing back into the skin rather than up out of the pore. For men, ingrown hairs are most common in the beard area. Guys who shave their heads can also get ingrown hairs on their scalp. For women, ingrown hairs are most common on the legs, underarms, lip and eyebrow area, basically, all the areas where we shave, tweeze, or wax. Just like pimples, ingrown hairs can hurt! You may even be able to see the hair just under the surface of the skin or in the swollen head of the blemish. Suspect ingrown hairs if your breakouts are concentrated in the areas where you shave. Got pimples in other areas too (like your forehead, chest, or back)? It's probably acne. Pimples can appear in the beard area (for men) but they also develop on other areas of the face, like the nose and forehead. Pimples are also common on the back, chest, shoulders, and neck. If you have breakouts where you don't shave or wax, it's likely acne. If you have just a couple of ingrown hairs, they will usually heal themselves with time. Using a face or body scrub in the areas where you tend to get ingrown hair can help keep hair lifted, and prevent ingrown hairs from developing. Changing your shaving technique can do a lot to help prevent ingrown hairs, too. Don't try for too close of a shave, and use a good shaving cream. Probably the best prevention is to stop shaving, waxing, and tweezing completely. You'll have to decide if this is an option you can live with. If you have a lot of ingrown hairs, especially if they are very red, inflamed, and painful, you might need a prescription medication to get them under control. Interestingly, some of the medications that are used to treat ingrown hairs are the same that are used to treat acne—tretinoin or topical antibiotics. And, just like with acne, cases of ingrown hairs can cause post-inflammatory hyperpigmentation or darkening of the skin. This can also be treated with tretinoin or azelaic acid. Serious or incessant cases of ingrown hairs should be seen by a physician. Ditto if you have a single ingrown hair that is extremely painful, swollen, and infected-looking. If your breakouts are minor, just a few pimples and blackheads here and there, over-the-counter acne products is a good first step. Try one with salicylic acid or benzoyl peroxide for several weeks and see if there is any improvement. More inflamed or widespread breakouts should be treated by a dermatologist. These types of acne typically don't improve with OTC products, so you'll probably need prescription medications to get them under control. These two skin issues can often look remarkably similar, and it can be hard to tell them apart. If you're not sure if you have acne or ingrown hairs, give your doctor a call! Your physician will be able to let you know exactly what is going on with your skin and help you devise a plan to treat it. Zaenglein AL, Pathy AL, Schlosser BJ, Alikhan A, Baldwin HE, et. al. 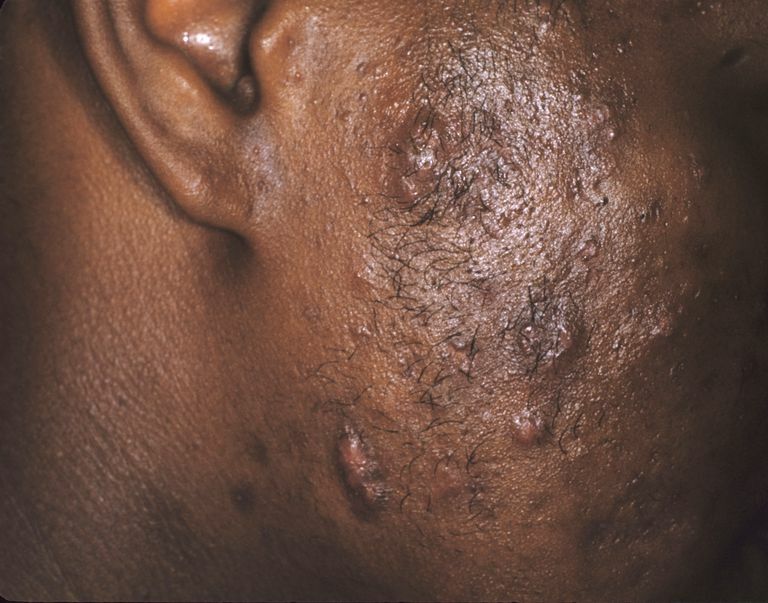 "Guidelines of Care for the Management of Acne Vulgaris." Journal of the American Academy of Dermatology. 2016; 74(5): 945-73. "Folliculitis." MedlinePlus. U.S. Library of Medicine, National Institutes of Health, 15 Feb. 2015. Web. Do You Have Acne or Another Skin Condition That Cause Pimples?